How do you say Happy Birthday to Someone Special? Well, I decided to wish my Mother-in-Law a Happy Birthday with the new Botanical Gardens suite! Designer Series Papers, stamps, and framelits! 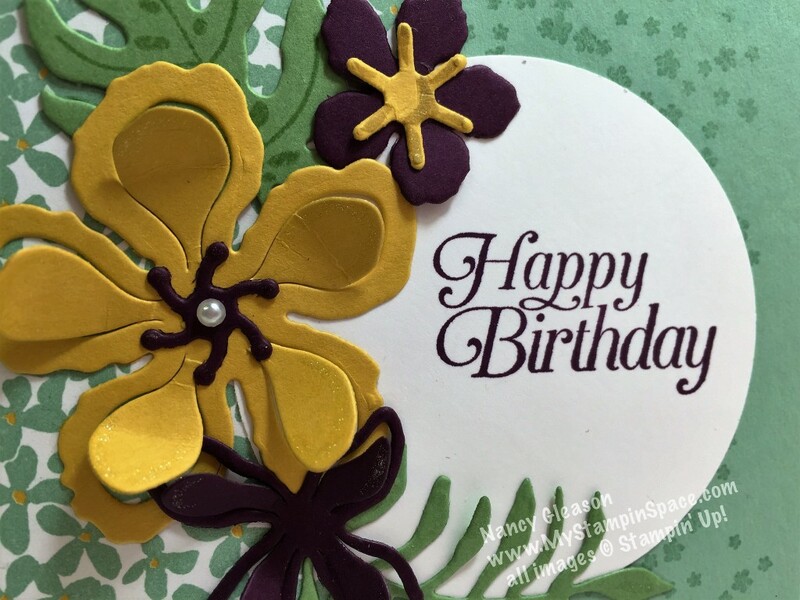 My Mother-in-Law loves flowers so I knew that this product suite would be the perfect thing to create a card for her. I started with the soft color of Mint Macaron for the card base. I then used a strip of Botanical Gardens designer series paper. I cropped a Whisper White circle and stamped it with the Happy Birthday greeting from the “Sky is the Limit” in Blackberry Bliss ink. 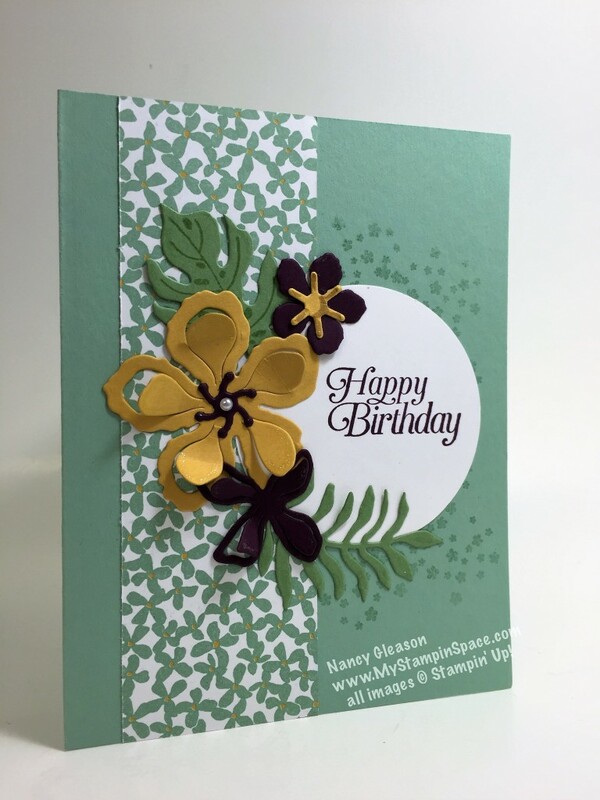 Hello, Honey and Blackberry Bliss cardstock was used to create the beautiful flowers from the Botanical Builder framelits dies. Look at those flowers; aren’t they beautiful? These dies create a 3-D type of flower! It really is like no other die I’ve seen before; almost like a new generation of framelit dies. It’s like a petal within a petal. Mom LOVED her card! And you? You’ll love the fact that the Botanical Gardens Suite is a bundle, and this bundle is a triple-play! This Bundle contains the Botanical Blooms stamp set, the Botanical Builder Framelit dies AND the Botanical Gardens Designer Series Paper! BONUS! This bundle, priced at $51.75 earns you a FREE Sale-A-Bration item! SWEET!!! I used the Sky is the Limit stamp set, which will be retired on February 15th. Now is a great time to score this bundle and stamp set, in a few days you will no longer be able to get this stamp set. And trust me, this is stamp set you’ll want! It makes great masculine cards, too! Thank you for stopping by My Stampin Space. Please leave me a comment and let me know what you think of this card; do you love it as much as Mom did? Come back soon as I’ll be sharing more birthday cards in the next few days.